ST. GEORGE – The 5th District Juvenile courtroom was full Wednesday as attorneys presented the judge with a resolution reached in an animal cruelty case involving a teen who shot and killed a kitten with blow darts in June 2014. Under the terms of the resolution, the teen admitted to facts in the case in exchange for having the third-degree felony charge against him for the killing and torture of a companion animal amended to a class A misdemeanor for aggravated animal cruelty, removing the “companion” and “torture” elements of the charge. Washington County Prosecuting Attorney Angela Adams said she didn’t feel the prosecution could prove beyond a reasonable doubt that the teen’s intent was to kill and torture the kitten. 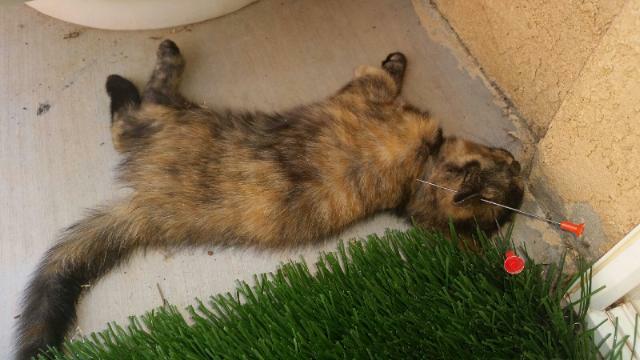 The kitten the teen was adjudged to have killed was discovered just outside the back door of a St. George man’s home. The kitten was lying dead with two 6-inch darts – sharpened spikes made of steel with plastic ends – protruding from its head. “I acted recklessly and caused the death of a cat,” the teen told the court Wednesday. The teen acknowledged that he intended to shoot the cat with the blow dart and scare the cat away, but said he didn’t intend for the cat to die. The courtroom benches were filled with approximately 15 animal rights activists. When the disposition had ended, animal rescue worker Kris Neal said she was satisfied with the results. Neal said she would like to see the laws changed to require stricter punishments in incidents involving animal cruelty. This kid should be tagged with an everlasting gps; a serial killer in the making. His parents should be fined. Could not prove that he was trying to kill the kitten? Sure. Wink, wink. In what ward was this again? Shooting a dart at a cat is intent of killing it. You can scare a cat away by clapping your hands loudly – it doesn’t take two 6″ sharpened steel spikes shot in the head to do the trick. This was so obviously a premeditated act.